Edinburgh moved up to seventh place in the Pro12 with a hard-fought win at Newport Gwent Dragons. Wales wing Hallam Amos scored two fine tries in the second half while Dorian Jones kicked five points for the hosts. But Hamish Watson's touchdown, plus eight points from Sam Hidalgo-Clyne and a penalty from Blair Kinghorn, proved enough for the visitors. Edinburgh move to within four points of rivals Glasgow in sixth, though the Warriors have a game in hand. 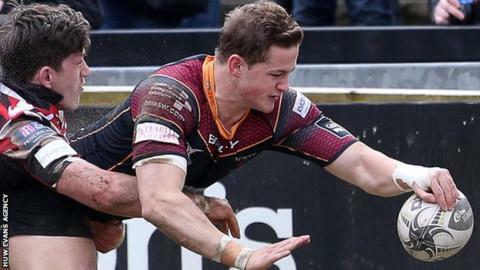 The Dragons had 20-year-old Wales centre Tyler Morgan and fly-half Dorian Jones back from long-term injuries, while Taulupe Faletau returned from Wales duties. Edinburgh scrum-half Hidalgo-Clyne was making his 50th appearance while the visitors also paraded their Scotland front row. On a muddy surface, the first half produced only penalties, with two from Hidalgo-Clyne and one from Kinghorn on target for the visitors, while Jones kicked one for the Dragons. Flanker Watson wasted a golden chance for the Scots after 24 minutes as he went for the line rather than using the men free outside. The Dragons started the second half at a higher tempo and after barely a minute, Amos sprinted through a gap to score with Jones' conversion giving them the lead. But Edinburgh struck back in their next attack as Watson wrestled his way over from a line-out drive and Hidalgo-Clyne put over the angled kick. Amos then produced a superb finish from 30 metres out when given an overlap from man-of-the-match Faletau's pass. But that unconverted score after 53 minutes proved to be the last of the match. Edinburgh kept the Dragons pinned in their own half in the final quarter but Hidalgo-Clyne was off target with two more penalty attempts as they failed to make their pressure pay. It was the Welsh side's ninth losing bonus point of the season, including five in the last six matches. Dragons host Ospreys on Friday in their final game at Rodney Parade this season, before their European Challenge Cup quarter-final at Gloucester on 9 April, while Edinburgh host Zebre on Friday. Newport Gwent Dragons: Carl Meyer; Ashton Hewitt, Tyler Morgan, Adam Warren, Hallam Amos; Dorian Jones, Sarel Pretorius; Phil Price, Thomas Rhys Thomas (capt), Brok Harris, Cory Hill, Rynard Landman, Lewis Evans, Nic Cudd, Taulupe Faletau. Replacements: Hugh Gustafson, Boris Stankovich, Lloyd Fairbrother, Matthew Screech, Ed Jackson, Charlie Davies, Angus O'Brien, Adam Hughes. Edinburgh: Blair Kinghorn, Damien Hoyland, Michael Allen, Sam Beard, Tom Brown; Phil Burleigh, Sam Hidalgo-Clyne; Alasdair Dickinson, Ross Ford (capt), WP Nel, Anton Bresler, Ben Toolis, Jamie Ritchie, Hamish Watson, Cornell Du Preez. Replacements: Stuart McInally, Rory Sutherland, John Andress, Alex Toolis, Magnus Bradbury, Sean Kennedy, Chris Dean, Dougie Fife.